The basic idea of common security is not complex. It is that no country can obtain security, in the long run, simply by taking unilateral decisions about its own military forces. This is because security depends also on the actions and reactions of potential adversaries. Security has to be found in common with those adversaries. These ideas were considered in a SIPRI conference held in 1983. The conference had two main objectives. The first was to undertake a critical examination of the concept. The second was to consider the implications of the idea for policy in general, and for disarmament and arms control policy in particular. Originally published in 1985, this book contains revised versions of some of the papers presented at the conference. Preface. 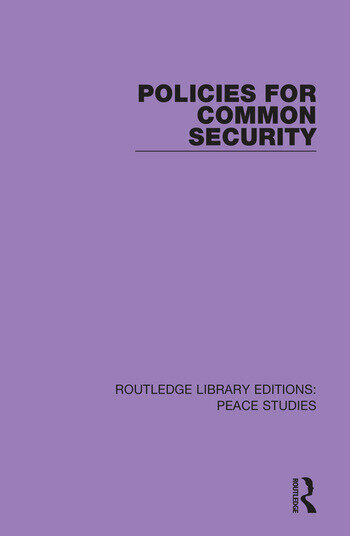 Introduction R. Väyrynen Part 1: Conceptual and Political Underpinnings of Common Security 1. Common Insecurity S. Bok 2. Observations on the Principle of Common Security E. Bahr 3. The Concept of Common Security M. Kaldor 4. Thoughts on the Concept of Common Security S. Hoffman 5. The Soviet Concept of Security V.V. Zagladin 6. Common Security and the Third World L. Mojsov Part 2: Deterrence and Common Security: Alternative Perspectives 7. Common Security and Deterrence E. Rothschild 8. The Death of Deterrence A. Krass 9. Common Security and the Limitation of War T. C. Schelling 10. Unilateral Actions as Confidence-Building Measures J.B. Wiesner 11. Atlantism, Pacifism and Common Security in Europe J.-P. Cot Part 3: Disengagement, Alternative Defence and Common Security in Europe 12. Policies of Common Security in Europe S. Lodgaard 13. The Détente Process and Common Security M. Saeter 14. Common Security and Defensive Security A. Mertes 15. Confidence Building and Nuclear Weapons in Europe J.J. Holst 16. On the Issue of a Chemical Weapon-Free Zone Kh. Lohs. Address by Dr Bruno Kreisky. Part 4: Reports of the Working Groups of the SIPRI International Conference on Common Security, September 1983 Report on the Discussions in Working Group I: The Concept of Common Security M. Hellström and E. Rothschild. Report on the Discussions in Working Group II: The USA–USSR Relationship and Common Security J.J. Holst. Report on the Discussions in Working Group III: Europe and Common Security A. Ferm and S. Lodgaard. Report on the Discussions in Working Group IV: Common Security and the Third World K. Dadzie. List of Participants at the SIPRI International Conference on Common Security, September 1983. Index.